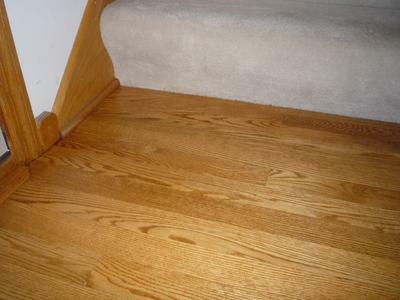 Homeowner Review of Wood Floor Wax Refinish. Attached are 2 "before" and 2 "after pictures based on a repair job. We had our carpets cleaned and the company we used utilized a super hot hose during their process. 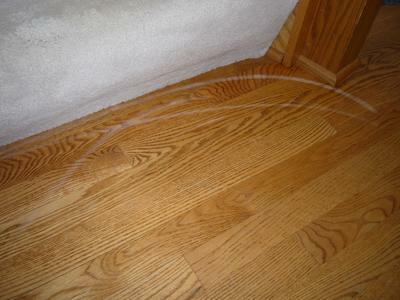 This process certainly did a nice job on the carpets, but these hoses were new and left boil marks on the wood floor. They were genuinely disappointed they had caused this issue, but to their credit, they stepped up to the plate and covered the repair cost. After the wood floor repair, our floor looks as good as new. Great job Jerry! This was a new wood floor repair for me. This old floor guy has never seen a hot hose blister. Can't say as I understand it, entirely, either. 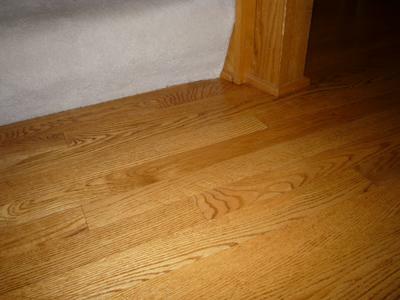 The readers should know that your floor is finished with an oil-modified polyurethane, for starters. heat got through the plastic shell very quickly and then dissipated very quickly, but stayed just long enough to lift the plastic shell from its surface, which is your wood floor. We don't think of it, but all plastic is permeable. I wondered if moisture played a part, and my guess is no. Moisture probably would have resulted in a black mark, and the marks I repaired were white in appearance, as you can see. The fix was an aggressive sanding of the polyurethane using 180 grit sand paper. That was enough to get at the blister and do the wood floor repair without going through to the floor stain. New carpet cleaning technologies bring a new learning curve, I am sure. It's the same in my trade. Whether the tradesman is coming to your home to clean the carpet or replace the fridge, I strongly recommend that the wood floor owner be there if at all possible. Even the night before, or the morning of the visit, put your own floor protection down regardless of all the assurances that they will do it for you. Ask them to still use their drop cloths, or whatever, right over yours to avoid that wood floor repair. Of course, sometimes the harder we try the worse things get. One of the truisms of living in the real world and not the perfect one. 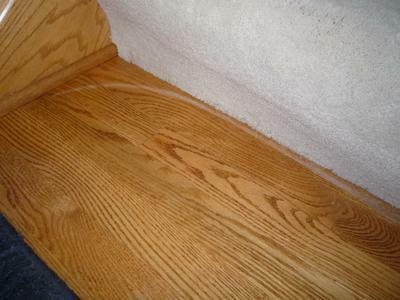 I am glad it all worked out, that I was able to make the wood floor repair with minimal cost and that the carpet cleaner covered it for you. That's what you get for only hiring reputable companies.